The cottage is detached and has a garden with a few fruit trees. is connected to mains water and electricity has aluminium doors and windows and had a new roof fitted a few years ago. The cottage does require some finishing work (painting and decoration) The cottage measures around 80 square metres of construction and has a ruin attached that can be renovated and would be ideal to increase the size of the cottage if needed. The main entrance to the cottage leads direct in to the living room, which has a tilled floor Off the living room there are two bedrooms, again with tilled floors and one with wooden ceiling. in the living room there is also access to the hallway and to the bathroom. The bathroom is fully tiled and has a bath , bidet , toilet and pedestal sink and as door to the third bedroom. This bedroom has a tilled floor and it has access from/to the hallway. From the hallway there is a storage room and access to a second living room and the kitchen. The kitchen has a tilled floor and partially tilled walls and has a good range of kitchen units . From the kitchen there is access to the property garden and to a small sun room. There is a detached garage building adjacent to the cottage. This garage building has a metal door and has also been constructed in metal but it is wired for electricity. The cottage is set on a plot measuring 260 square metres and there are a variety of mature fruit trees. The garden is fairly flat and all fenced, ideal for someone looking for a low cost and easy maintenance garden. 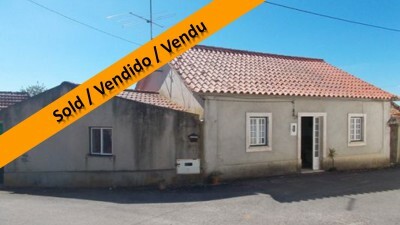 The property is situated near the village of Sabacheira in central Portugal. The closest town to the property is situated at Tomar, which is approximately 14 kilometres away. Tomar is an historic market town, which is home to the famous UNESCO listed Convento do Cristo constructed by the Knight Templars in the 12th century. Tomar has several large supermarkets, shops, cafes, restaurants, schools, banks, pharmacies, hospital, health centres, sports centres and bus and train stations. In addition to this it has a weekly market on Fridays and a flea market once a month. The closest airport to the property is situated at Lisbon, which is approximately 145 kilometres drive. Lisbon airport is serviced by a selection of low cost airlines which operate regular flights into and out of the United Kingdom.